Lead-based paint was banned in 1978. If your house was built before then, you should have it tested for lead before attempting a home remodeling project. Armend’s Painting and Home Improvements specialize in lead paint removal in Waterbury, CT, and the surrounding areas. These renovation experts have been in business for over 20 years, and here, they explain three lead paint removal steps. Lead is a dangerous substance because you don’t even have to touch it to experience health problems. You can develop lead poisoning just by inhaling the dust. That’s why it’s so important to prevent the spread of dust or other debris. To do this, your lead removal expert will spread six-mil polyethylene plastic over your floors, furniture, and windows. They will also use this poly plastic to cover the door opening. When it’s time to remove paint or other lead-based material, it’s important to work wet. 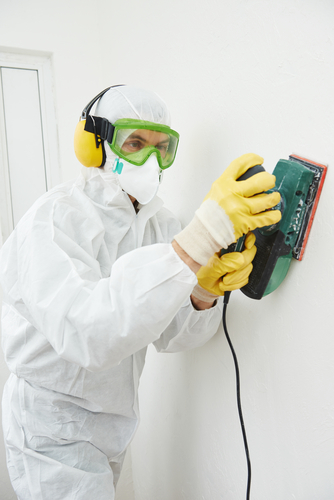 By spraying the surface with water, dust is less likely to spread, but the contractor must still wear proper protective clothing. This includes a half mask respirator with a filter, goggles or glasses to protect the eyes, and shoe covers to prevent spreading contaminants to another room. All surfaces must be washed down to remove any remaining dust. The poly plastic should be sprayed with water to prevent the dust from moving around during clean-up. All of it can be bagged and discarded in the trash. It’s important to use a vacuum with a HEPA filter to clean up paint chips and dust along the sides. It’s best to hire an expert for lead paint removal to keep you and your loved ones safe from exposure. Armend’s Painting and Home Improvement has an A rating on Angie’s List, where they have even received a Superior Service Award in the past. Find out how they can fix your house by visiting their website or calling (203) 597-7179.